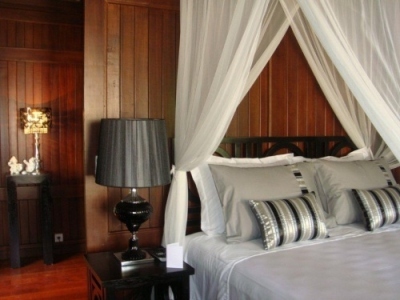 This is really an exotic, luxurious hide away for your holiday or maybe a private business rendez-vous in need of getting away from it all and to create a relaxed, creative mind. This Bali “estate” offers a world where the old and authentic Bali blends the 21th century comfort and contemporary elegance. Villa Arimbi is like a small hotel with 6 different pavilions surrounded by an amazing tropical garden made by a famous landscape architect. Here you can enjoy total relaxation and really get the spirit of exotic, colonial-style living, far away from home and with a friendly staff taking full care of you. 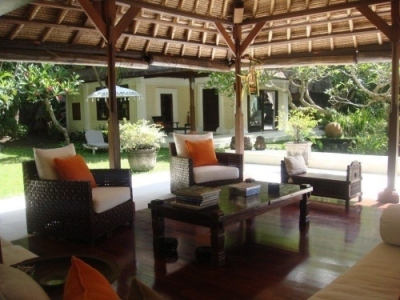 Villa Arimbi has the perfect location in the prestigious Sanur neighborhood on the south part of Bali. You have 5 minutes walk to the fantastic beach and you are close to nice local attractions. Once you moved in, you don’t want to leave! The main house offers 5 comfortable bedrooms with ensuite bathrooms, all designed differently with aircond, safe deposit box, flatscreen TV. There is also extra areas where children can sleep, so in total you can be 10-13 guests in the villa. The magnificent design of the villa with all the open living areas, gives you plenty of space for entertainment, cooking, relaxing, having massage, watching TV/DVD (kids maybe? ), enjoying afternoon drinks, having a nap next to the pool and getting ready for a romantic dinners with the sounds and lights from your exotic garden. There is a lot of nice arrangements included in the price, like free linnen, towels, bathrobes, bathroom products and daily maid service. You can also ad complimentary service like; breakfast, grocery shopping, cooking, sarong, afternoon tea, airport transfers, guide service etc. 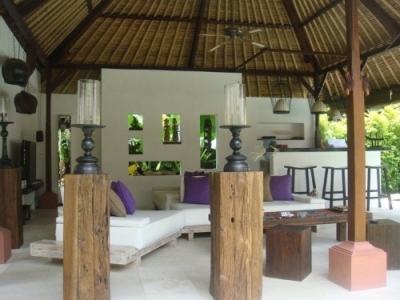 This is truly the perfect Balinese holiday villa with everything you can dream of. 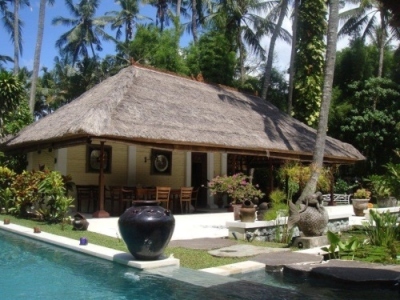 The design of the villa is based on the traditional Balinese architectural focused on the magnificent garden with several bungalows/pavilions that offers open living spaces and intimate sleeping. Here you have library, fully equipped kitchen, living room, dining room, bar, office with telephone, copier, printer, scanner, massage room, 5 bedrooms, 5 bathrooms, wifi, aircond, TV/DVD, soundsystem, fans, parking. Pool 12x 4,50m and outdoor shower. 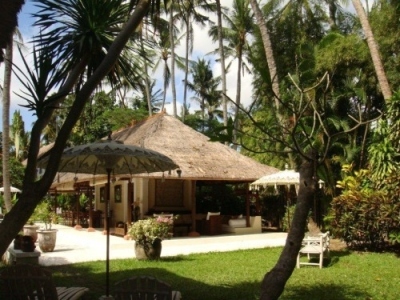 Sanur is situated on the southern part of Bali, 20 minutes drive from Ngurah Rai International Airport. 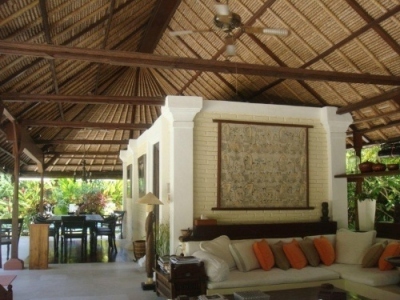 Villa Arimbi is tucked into the residential and peaceful area of Mertasari in the south end of Sanur . Sanur is being one of the first resorts developed in Bali, famous for the white sandy beaches protected by coral reefs, and spectacular sunrises. You find anything you want close by: all kind of water activities, tennis, golf, kayaking, mountain biking, jungle walking, tourist and nature attractions, nightlife etc. Bali is also a fantastic shopping paradise, so bring your biggest bags.